Home / Brexit / Humour / London / News / UK / Best Brexit Sign Ever at Pimlico Plumbers ! 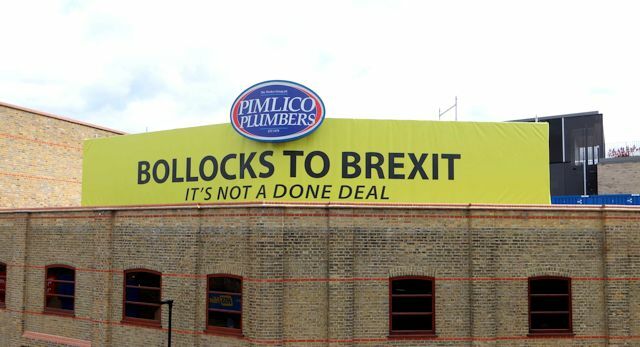 Best Brexit Sign Ever at Pimlico Plumbers ! Camden's Charlie Mullins, OBE, left school at 15 with no qualification so he worked. Hard. He founded the famous Pimlico Plumbers, now London Premier Plumbing Company. Rightly so, he doesn't like Brexit very much, and he's added this awesome sign to his company rooftop for all to see. There are plenty of losers where #Brexit is concerned & none greater than the UK economy. I am not prepared to sit back & let Theresa May’s unhinged & frankly, dangerous #Government blindly walk Britain into a recession. It's time to stop Brexit!